The weather, which thus far had been unseasonably cool with rain several times each day, had every indication of worsening. The frustrations of no Internet and nothing but foreign language radio stations, had reduced weather forecasting to the traditional wet finger in the air followed by a knowing nod. Based on this divination, we decided to leave the Loire valley, and skip both Poitiers and Limoge on our flight south. 200 miles later found us in Rocamadour with the weather little changed. So much for the occult! 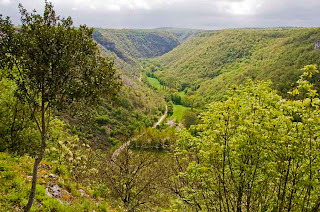 If nothing else, Rocamadour in Occitan, a commune of southwestern France in the canton of Gramat, arrondissement of Gourdon, department of Lot, in the diocese of Cahors and the former province of Quercy, has a grand administrative title. That wasn't the half of it, however. 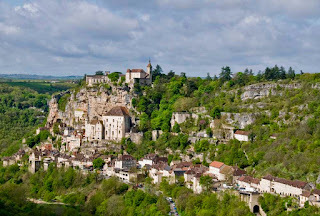 Rocamadour is a tiny village of about 650 people that is part carved into and part attached to, an almost sheer 400 foot high cliff face overlooking the Alzou river, a tributary of the Dordogne. Since the 12th century this location has been the focus of religious attention and wishful thinking, including numerous alleged miracles elevating it to major pilgrim status and a stop on the way to that holy of holies, Santiago de Compostella in northern Spain. 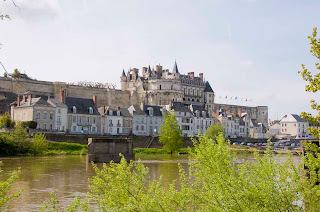 Saumur is a mid-sized town - about 30,000 folk - and like Tours, the old town is built on a narrow strip of land between the Loire and, in this case, the Thouet rivers. 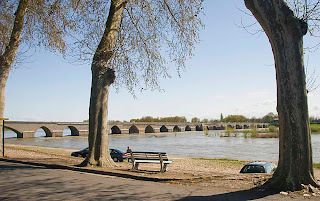 There is a large island in the Loire at this point, which is heavily built up and is used by both of the town's bridges as a stepping stone across the river. 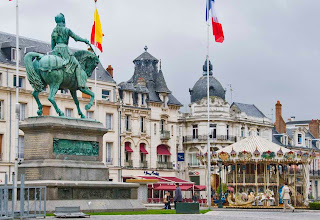 The town has a military background being home to the Cadre Noir, The National School of Horsemanship, the Officer School for Armored Forces and the Musee des Blindes, the largest collection of armored vehicles in the world. Saumur was also vigorously involved in the closing year of WWII in Europe and was the first recipient of the Tallboy Bomb, designed by the extraordinary engineer Barnes Wallis. Worth a quick look if you have any nerd blood in your veins whatsoever! But, I digress. 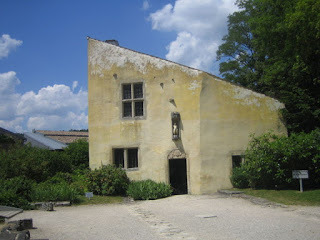 We didn't visit any of the above but instead, roamed around gaping at the chateau and other excellent edifices. 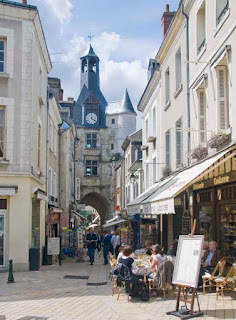 To see more of Saumur, follow this link. Continuing our sojourn down the Loire valley with no particular agenda, we suddenly spied what looked like chimneys rising from the top of a cliff. "Aliens! ", we cried, and promptly swerved off the road to investigate. Nothing so mundane – troglodytes, it turned out, were responsible for these curious features. A member of a fabulous or prehistoric race of people that lived in caves, dens, or holes. A person considered to be reclusive, reactionary, out of date, or brutish. 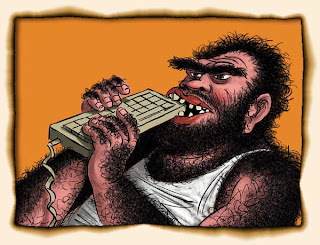 An anthropoid ape, such as a gorilla or chimpanzee. An animal that lives underground, as an ant or a worm. Upon further investigation, it appears that word troglodyte is quite broadly applied and is used to refer to anything, even people, that live underground. For centuries, troglodyte dwellers have cut caves into the limestone cliffs to produce secure, low cost and durable homes and then simply lived in them. The limestone walling the Loire valley in this region, known as tufa, is particularly suitable for this activity. Other uses of the caves include mushroom growing, wine storage and, latterly, some have been converted to restaurants and second homes. The group we visited produced wine and the wily proprietors promptly perpetrated a bait and switch routine and sold us a rather expensive bottle of the stuff. Cunning old troglodyte! For further revelations, click here. 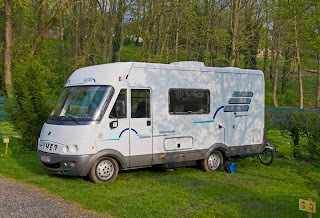 Amboise is the fourth or fifth European campground we have stayed in that is located on an island in the middle of river. About an equal number of other sites have been situated on river banks. In the case of Amboise, L'Ile d'Or is about 1-1/4 miles long and a fifth of a mile wide at the center, and the land primarily consists of recreation space and the campground. One supposes that all of these situations are prone to serious and dangerous flooding and are thus reserved for non-essential and easily evacuated use. Certainly they provide attractive and quiet retreats. 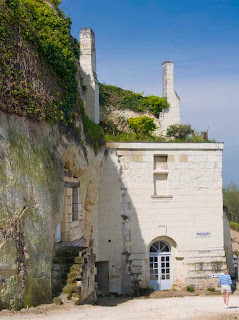 The Chateau d’Amboise is one of the more historically significant buildings in France, perhaps even in Europe. Louis XI lived there, Charles VIII was born there and also died there, Francois I was raised there as were all ten children of Catherine de Medici. In 1560, the failed Huguenot plot against Francois II was mounted there and Leonardo da Vinci is buried in the Chapel of St Hubert built on the ramparts. The original entry tower, the Tour des Minimes, houses a spiral ramp large enough for horsemen to ride up to make deliveries. The entire historic area has been splendidly restored and makes for a high quality visit. We had a nice walkabout, click here for more pictures. 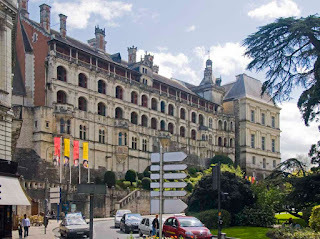 For generations, Blois was the principal royal residence of France until Henri IV moved the court to Paris in 1598. Nowadays, it is a well-kept historic town successfully blended with a bustling community – truly a relaxing and pleasurable place to visit. In general, the terrain around the 120-mile stretch of the Loire that we are following is flat farmland. Flood control has been accomplished by a 20-foot high levee built on each side of the river and, subsequently, a road has been built along each levee. Numerous masonry farmhouses and outbuildings that existed long before the levees are still extant, many almost buried by the levees. It is odd to see chimneys, bedroom windows and barn attics flash by that appear to be growing out of the grass verges not twenty feet from the road. Access to these establishments and to miles of cycling lanes – the prior road system – is by frequent, death-defying ramps, cut in the side of the levee. We did not venture down. The Royal Château de Blois was the residence of several French kings, it is also where Joan of Arc went in 1429 to be blessed by the Archbishop of Reims before departing with her army to drive the English from Orléans. 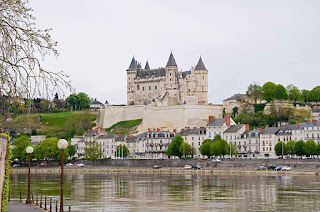 Today, the château is owned by the town of Blois. For more, click here. Orleans and Blois, both on the River Loire, are about 35 miles apart and Beaugency, also on the river, is about halfway between. Until recent times, the 11th century Beaugency bridge was the only crossing along this entire stretch of the river. 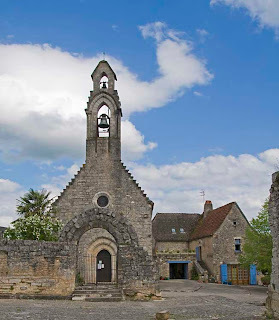 This made Beaugency of such strategic importance, that the town and the bridge were captured four times by the English during the Hundred Years War and were finally recaptured by none other than Joan of Arc in 1429. 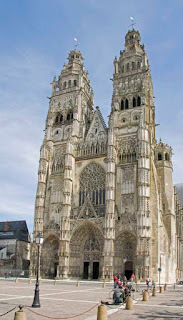 Much earlier, in 1152, in the Romanesque Notre Dame abbey church, the marriage of Eleanor of Aquitaine and Louis VII was annulled freeing Eleanor to marry the future Henry II of England. Scandalous, eh? For more old ruins, click here. Orleans and Joan of Arc seem to be inseparable. This city, on the banks of the River Loire, reminds me of the movie Groundhog Day in which the same day repeats and repeats. Wholly rooted in the past, Orleans seems to sleep walk from one Joan d'Arc festival to the next. Joan was born in 1412 to fairly well-off farmer parents, Jacques and Isabelle d'Arc in Donremy, a village of a couple of hundred souls in eastern France. See their home at right. 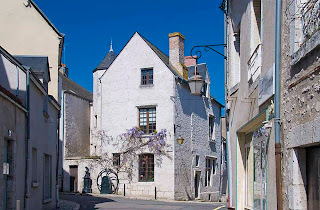 A rough outline of her life and beyond is as follows: 1424, at age 12, the voices and visions begin, although she never revealed this to anyone until 1429 when it became politically expedient to do so; 1429, lobbied the Dauphin and others in Chinon to let her have at the English siege installations at Orleans; May 1429 routed the English at Orleans and hung out there for a couple of months; subsequent successes were lesser, stymied by various political intrigues and jealousies; captured by the English at Compiegne in 1430, apparently betrayed by French courtiers; first quarter of 1431 a scurrilous trial was orchestrated by the English, resulting in the famous bonfire; twenty-four years later in 1455, the court decision was reversed declaring Joan innocent and promoting her to martyr status - not much help to Joan as it turned out; four and a half centuries later, in 1909, she was beatified; finally, she was canonized to sainthood in 1920. Ain't politics great? 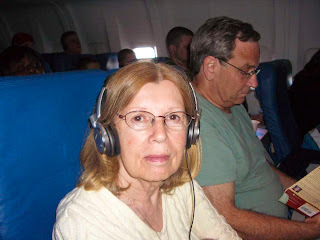 For more details of Joan's short life, click here. 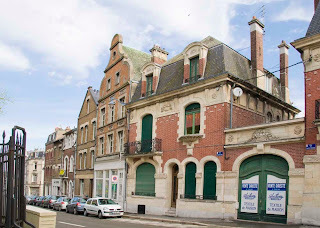 In reality, apart from the initial siege busting, there is not much connecting Joan to Orleans, which is an interesting city in its own right. To see some pictures around town, click here. Well, easy days can sometimes get harder. After a luscious lunch by the canal in Verneuil we set off on the D939 road to Chartres. By the time we were installed in the campground it was still only 4 o'clock, the sun was shining, sunset was at 9:45 pm and so we hooked Heidi to the 3 amp supply, grabbed the bikes and cycled the three miles into town. What a lazy day this turned out to be. 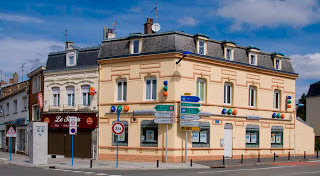 Following elevenses in Chandai, we stopped again a little later for lunch, this time in Verneuil-Sur-Avre, a larger town of about 6,000. 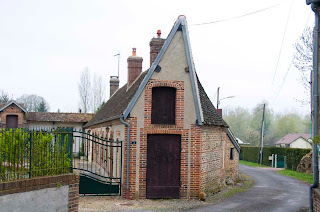 In the meantime we had progressed a little, having entered the Eure department of Lower Normandy and had also reached the end of the N26 highway. Over the centuries, Verneuil has seen its share of warfare and ownership changes from the time the stronghold was developed in 1120 by Henri 1st (the son of William the Conqueror). 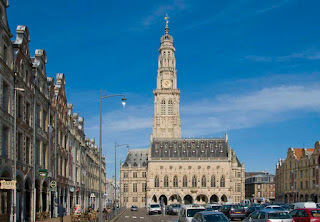 During the 100 years war it briefly fell into English possession and suffered its most recent hostilities in WWII when the church of Saint Jean (shown at right) was bombed in 1944. The main square, Place de Madeline, is rich with 17th and 18th century buildings including many inevitable half-timbered houses. There are several pedestrianized streets that are similarly endowed. For more pictures, click here. While chugging cheerfully to Chatres we chanced upon Chandai Church, with its unusual octagonal clock tower. Based on the excited twittering from the co-pilot seat I deduced that a photo break was being ordered so I dutifully pulled into a handy bus stop space and made a cup of tea. 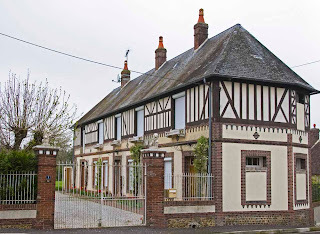 Chandai is on the N26 Route in the Orne Department of Lower Normandy and amounts to a half dozen streets with maybe 100 inhabitants. A pleasant place to spend our mid-morning recess and snap a few pictures. The church, sadly, was locked and, during the 45 minutes that we were there, we saw no sign of life anywhere - mind you, the temperature was in the mid-fifties with occasional rain. This good looking house was right across the street from the church. The N26, a National road engineered in Napoleon's time for military purposes, is a simple two lane highway distinguished, like all N roads, by long straight sections. Like US Highways in the States, National roads connect national objectives, continuing right across department and region boundaries (roughly equivalent to counties and states in the US). On the other hand, the D roads (Department roads) are more like county highways in the US except they are often extremely winding and narrow. Fifty yards down the road from the church was this wonderful example of architectural expediency, where the roof appears to have been designed on the fly to keep within property boundaries following some earlier constructional missteps. "The best-laid schemes o' mice an' men gang aft a-gley" wrote Robbie Burns in his poem To a Mouse. To avoid the perils of this truism we usually don't have a plan although we seem to get in trouble just as often as those that do. Such was the case when looking for a campsite in Beauvais after a grueling day in Arras - none were to be found! We were progressively directed further and further out into the boonies, ultimately to Saint Germer de Fly where there was, we were assured, an open site - guaranteed! Well, there was a site but it did not open for another six weeks. Onward and upward we reached an even more remote burg called Le Coudray Saint Germer where we slithered into a mud-hole that, after a month or so of dry weather, might have made an acceptable site. Nonetheless, it felt like a triumph to us. 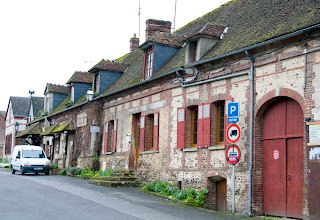 The following morning we checked out Saint Germer Le Fly, a tiny town of 1,600 souls, on our way through to Rouen. Saint Germer himself built a Benedictine Abbey there in the 7th century and became the first abbot. The Normans destroyed the abbey in the 9th century and again, after it was rebuilt, in the 10th century. In the 12th century it was rebuilt yet again, this time as a Cistercian abbey complete with a grand abbey church. Take the tour for more details. At the tender age of nineteen, that uppity gal, Joan of Arc, was burnt to death in this fair city. The year was 1431, 92 years after the start of the Hundred Years War and 22 years before its conclusion. And, no, it is not true that Joan of Arc was Noah's daughter. Rouen is in Upper Normandy and straddles the River Seine, the same river that runs through Paris. Situated at the widest point that the river could be bridged at that time, Rouen was, at one time, the third largest port in France although it has since slipped to fifth place. A mid-sized city - 110,000 population, give or take a few, in the city proper - it is rife with stuff to gawk at. As usual, parking anywhere near downtown was not possible so we drove out a mile or so until we found an open spot in an safe looking residential area and then took a bus back into the center. The area where we parked is called The Cottages and one side of the street was lined with cute looking abodes like the one in the picture. 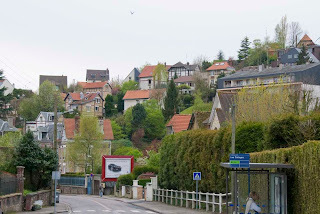 The terrain around Rouen is quite hilly and houses are jammed into every available space. 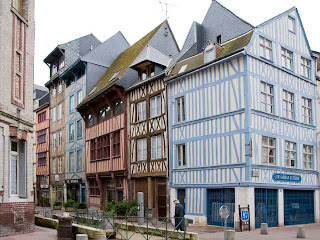 In turn, a Celtic trading post, a Roman garrison, a Viking colony, the capital of the Norman Duchy, a British possession on and off during the Hundred Years war, then mainly French except for WWII when it was German for a while, Rouen has endured many changes of allegiance, typical throughout Europe. The city was seriously damaged in WWII. Click here for a tour. It doesn't seem to matter where one goes in Europe, the Celts have always been there first. Arras turned out to be no exception - first the Celts then the Romans and later bouncing back and forth between the French and the Dutch. It wasn't until the late 17th century that the French grabbed for the last time, settling the issue by fortifying it significantly. Later, Arras had the misfortune to be in the path of both WWI and WWII and suffered major destruction in both of these conflicts. In turn, this devastation became the object of a successful post WWII reconstruction effort, during which a large part of the city center was restored to its pre-WWI condition. The city is centered around Grand Place and Place des Heros, two large cobbled squares (actually rectangles), which are surrounded by more than one hundred and fifty rebuilt 17th century Flemish style facades. This accomplishment has successfully kept the downtown as area a lively and enjoyable place to visit. 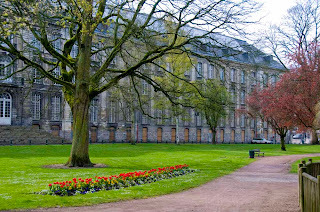 In the Place des Heros stands the rebuilt flamboyant Hotel de Ville (Town Hall) that contains a number of permanent historical exhibits and also hosts transient displays of art and crafts. On the Sunday that we visited it was a busy and bustling building. Elsewhere about town is a cathedral, an enormous abbey and several churches. Bapaume is a little burg in the Pas de Calais region of northern France that just happens to straddle the road we were meandering along on our way south. 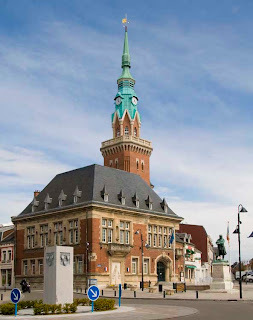 Standing close to a roundabout in the center of town is the striking Mairie, or Mayor's Office, which doubles as the Hotel de Ville. We found a spot to park and went walkabout. 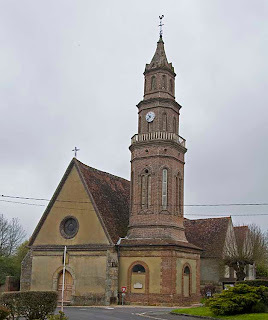 During WWI Bapaume was one of numerous local villages that were practically leveled and buried in mud during the travesty that was the Battle of the Somme, launched July 1st, 1916. On the first day alone, the campaign resulted in the death or injury of 58,000 British troops and by its end is estimated to have accounted for 420,000 British casualties, 200,000 French and 500,000 Germans - more than a million men in one no-gain battle. 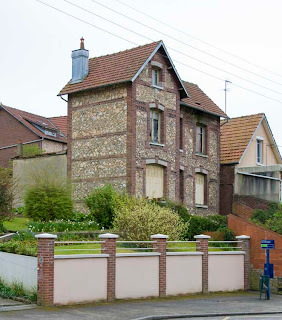 Today, following a further trashing during WWII, Bapaume is home to about 5,000 inhabitants. Being overrun, occupied and used as a battlefield twice in the space of a generation, has to be something that must be experienced to be fully comprehended. 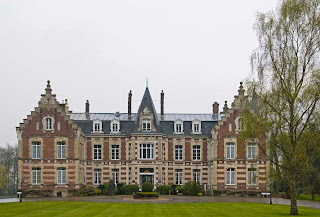 On the way to Saint Omer we stopped by the Chateau de Tilques, a former grand residence now recast as an anachronistic hotel and restaurant in a genteel effort to meet its tax obligations. All things considered, this turned out to be the highlight of the day. 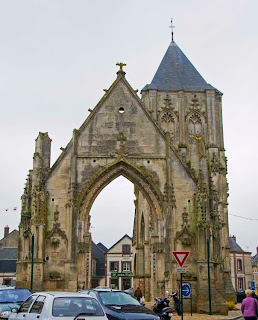 Saint Omer is billed in the guide books as "...refined and seemingly untouched..." While we didn't find much in the way of refinement, untouched abounded everywhere. 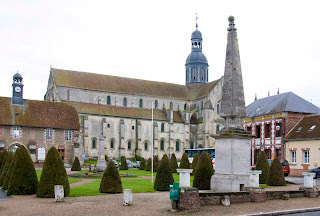 Two major features on offer are the ruins of the 15th century Saint Bertin Abbey in the east end and l'église Saint-Sépulcre, in the center of town, that has been untouched almost to the point of extinction. 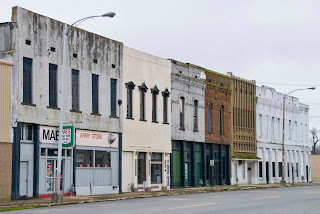 There are some better maintained buildings in town but, in general, the city had a run down air and little that qualified as charming (a euphemism for small and kitschy) or quaint (a synonym for hopelessly impracticable). 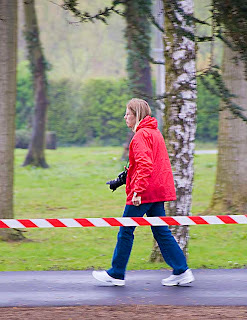 Overall, this area of France majors in ugly churches and my location scout, seen here in her official red uniform, was hard pressed even to find lunch. 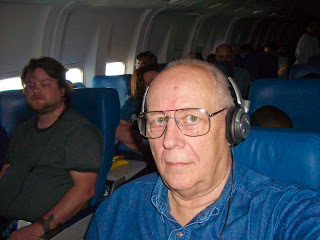 After a four hour layover in Cincinnati, we boarded the Delta airplane which took off promptly and headed east. In our book, this is the toughest part of visiting Europe. Eight PM in Cincinnati starts an eight hour flight to Gatwick, England making arrival time four o'clock the following morning. Add to this a time change of five hours and the local arrival time in the UK becomes 9:00 AM the following morning - the start of a new day, having already been up for twenty plus hours. Pretty wearing. We were picked up at the airport by Heidi's owner and whisked away to the Heidi House. Later in the day, we bought enough groceries to get us to the continent and then set about completing the preparation of the little camper van. In the evening, our host, Paul, the wannabe hippie, served up one of his delicious dinners, after which we reviewed some maps and travel books before retiring. Bright and early on Friday morning we completed our pre-flight training and took off in the direction of Dover, a seaport on the southeast corner of England, valiantly remembering to drive on the left side of the road in a left hand drive vehicle no less! Dover is a busy port and, even in this, the low season, about 30,000 passengers, 200 passenger coaches, 5,000 cars and 8,000 semi style trucks cross the English Channel each day from this one location. We bought a ticket to Calais and quickly boarded the 3:15 PM Sea-France ferry. The crossing to Calais - 22 miles or so - takes about 1-1/2 hours and picks up another one hour time change to get on western European time. Remarkably, a 500 mL bottle of water at the bar on the ferry cost $2.80 while 750 mL bottles of wine were only $3.20 in the duty-free store. We took the opportunity to stock up on vino. 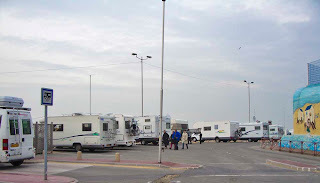 After disembarking in Calais we made the short trip to the local Aire de Service at the Calais "Silver Beach" and enjoyed a much needed early night. Woke up this morning and realized today was the day to go to Europe and make like a tourist. Whoopee! This year we only packed about twice what we are likely to need - last year was close to four times - and ended up with two small cases and a couple of backpacks for toys. Daughter III, Marika, kindly ran us to the airport in her art deco Mini Cooper, so the minimal baggage paid immediate dividends inasmuch as it all went in the car along with us old dears. 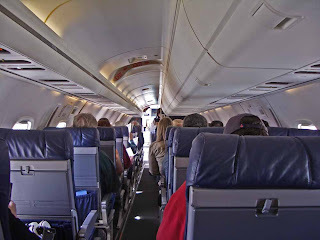 Presumably because we look so expendable, we were assigned to the very back row - lucky 13 no less - of an absurdly small airplane for the 23 minute trip to Cincinnati which took a little over an hour. Airlines must use really big minutes if you ask me. Anyway, Marian became immediately and completely absorbed in the Sky Mall book, so I cast about for something to do and fell into conversation with a nice little number across the aisle. Thinking I was on to a good thing, I began to wonder how I could convince her there was life in the old dog yet when she revealed to me that she was 90 years of age - darned cradle snatchers! - I hate it when that happens. What an amazing lady though. More energy than the two of us put together, has lived all over the world and was currently off visiting grandkids in Utah and California. Left us both feeling quite jaded and determined to do better. We're now thralling to the delights of Cincinnati Airport for four hours waiting to board Air France for England and beyond. Today we visited with one of the north eastern Indiana Good Sam Chapters and enjoyed a super supper comprising all the comfort foods you could imagine. Not too good for the figure but downright enjoyable! This meeting was part of a camping weekend hosted Charles and Annette Best which we, inept as we are, attended without even owning an RV. Oh well, one day maybe, we will get something right. 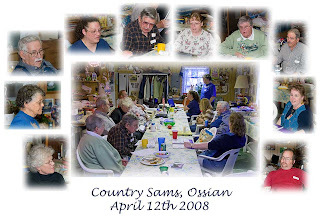 Country Sams is a small but active group with a dozen or more meetings each year, most of which are camping outings. As wacky as they are, this group has become a highlight at the Indiana Samborees which are held each spring and fall. Later in the year, when we will actually be RVers again, we hope to join these folk at some events around the state. 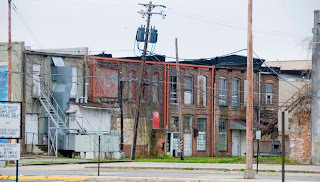 Downtown Pine Bluff, Arkansas, population 55,000, has suffered a long running disembowelment resulting from natural causes, economic vagaries, industrial pillaging and misguided city management. Once a thriving agricultural center anchored by the cotton industry, it received a mortal blow in 1927 when the Arkansas River burst its banks and put most of Jefferson county underwater. Ironically, a drought in 1930 resulted in complete crop failures and was then followed by the depression years that stymied most recovery efforts. It wasn't until 1941, when the US Army bought a large tract of land north of town and built an arsenal, that economic diversity finally began to take hold. In the 1950s, two paper companies each built plants close to town, providing further diversity and absorbing more of the unemployed. 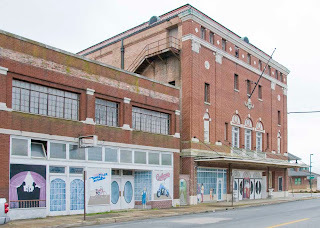 In the sixties, Pine Bluff, like so many other medium sized cities across the US, began participating in its own downtown demise by opening a shopping center on the south side, followed, fifteen years later, by an enclosed mall on the east side. Finally, to choke the last breath of life out of the once thriving downtown, a Wal-Mart Super-Center opened in 2004 on what had previously been farmland just south of town. The results of all of this progress are horribly clear. A quarter of the downtown area has been razed, leaving unsightly vacant blocks partly covered in grass and weeds. Half of the remaining buildings are empty, many others for sale and yet others cordoned off with plastic tape because chunks are crumbling off and falling to the street. As elsewhere, no solution to this sorry state of affairs is in sight and it remains to be seen what the end point of such deterioration will be. On the Pine Bluff website, much is made of the Rail Road Museum and the country's only Band Museum. Unfortunately, the Band Museum appears to be history and the Rail Road Museum may not be too far behind. Finally, in what has come to be one of our hallmarks of poverty stricken southern towns, Pine Bluff has got murals! Claimed to be the place with more antebellum houses than any other city in the country, we stopped by for a day on our way north after our winter retreat. What a delight! A cozy Wal-Mart campground, easy parking right on Main Street for access to a great walkabout, no graffiti, heaps of history, a pleasant park complete with fountain, a great website for planning and a rigorous river walk as an unplanned bonus. Better yet, if you enjoy old photographs, you can be in for a further treat. On the second floor at the rear of the Presbyterian Church is, perhaps, the finest photograph collection covering the period 1870 through 1913 anywhere in the USA. 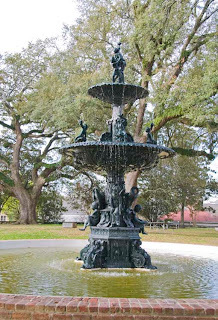 Thousands of these pictorial treasures are on permanent display where they minutely document life across all classes in the Natchez area, from the recovery after the Civil War to the darkening period before the Great War. A must see attraction if you're ever in town. 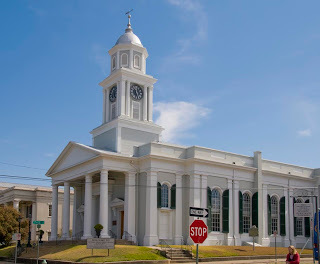 As for historic buildings, there are more than 50 antebellum houses, churches and other structures in and around Natchez. 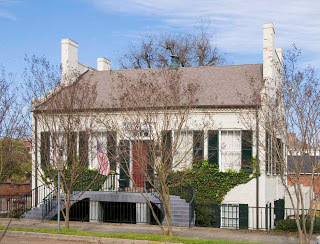 An enduring disappointment for me, however, has been a lifelong expectation that antebellum was synonymous with the lavish Hollywood depictions of sprawling pads, housing dozens of people, such as that in the Bette Davis movie Jezebel, or others that appeared in Gone with the Wind. Reality, of course, is a mean taskmaster and most genuine antebellum homes were somewhat modest by today's standards. Nonetheless, if you ever get into this neck of the woods, do allow a day or so to enjoy the unique offerings of this cherished piece of Americana. Cresent City - whose time has come...and gone? 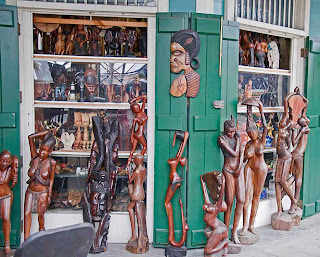 We used to visit New Orleans occasionally, prior to Katrina, but have not been there for half-a-dozen years or more. To my mind, the place was always more hype than substance but, with the frequent parades, some questionably "great" restaurants and subtle hints of Cajun mystery with a dash of voodoo, it was no worse than any of the other gawker cities around the country. That was then - this is now. 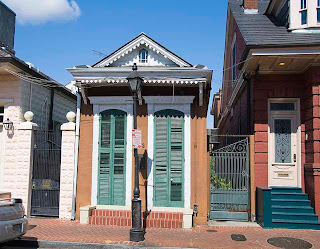 The Katrina flood seems to have permanently washed away any remnants of mystique and authenticity from the city, in addition to the dozens of neighborhoods which, too, are unlikely ever to be resuscitated. Along Interstate 10 to the east of town, a number of off ramps are closed by barriers and the closed roadways are overgrown with grass and weeds. The flora all along the highway doesn't do anything to dispel the air of dilapidation either. Many trees were snapped off by the winds and everything that is surviving has a sickly appearance, probably due to the inundation with sea water. 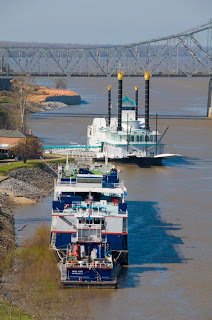 An enterprise that has appeared since the waters receded, is the French Quarter RV camp ground. This is an easy walk from "downtown" and yet provides believable security in a city seething with petty crime horror stories. 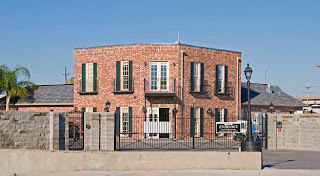 The regular rates are about $60.00 per night but, in times like Mardi Gras or the Jazz Festival, watch out - rates go as high as $200.00 per night with a three night minimum!